Thank you for your contributions to the Colleyville Lions Club and our community! Advance Eyelid Surgery Center Americo Leasing LTD.
Boulevard Animal Hospital, P.C. Dr. Charles Bradley, DDS, Inc.
Dr. Jesse Schroeder, DDS, MS, PA Jonathan Richard, M.D. State Farm Insurance – Tye Strickland Surgical & Diagnostic Center, L.P.
2010 15th Annual Breakfast with Santa is just around the corner! 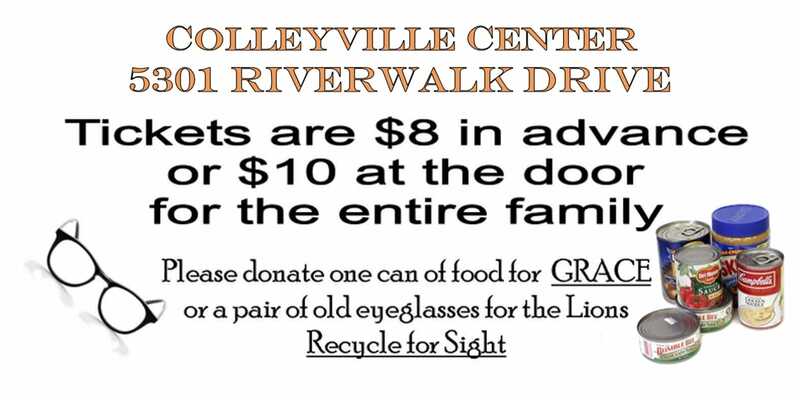 On behalf of the Colleyville Lions Club, we would like to ask for your support. We are having our 15th annual Breakfast with Santa on Saturday, December 4th 2010, and would like you to join us as a sponsor and guest. https://colleyvillelions.com/wp-content/uploads/2014/12/BWS_Logo-450x450.jpg 450 450 David Phelps /wp-content/uploads/2014/03/logoColleyvilleLionsClub.png David Phelps2010-11-04 03:40:002015-07-16 16:10:222010 15th Annual Breakfast with Santa is just around the corner! 2010 15th Annual Breakfast With Santa is Coming! Review the Sponsorship Document to discover more details on how you can become a sponsor and assist us with this wonderful event that brings joy to children and adults alike. https://colleyvillelions.com/wp-content/uploads/2014/12/BWS_Logo-450x450.jpg 450 450 David Phelps /wp-content/uploads/2014/03/logoColleyvilleLionsClub.png David Phelps2010-10-24 02:20:002015-07-16 16:11:042010 15th Annual Breakfast With Santa is Coming! 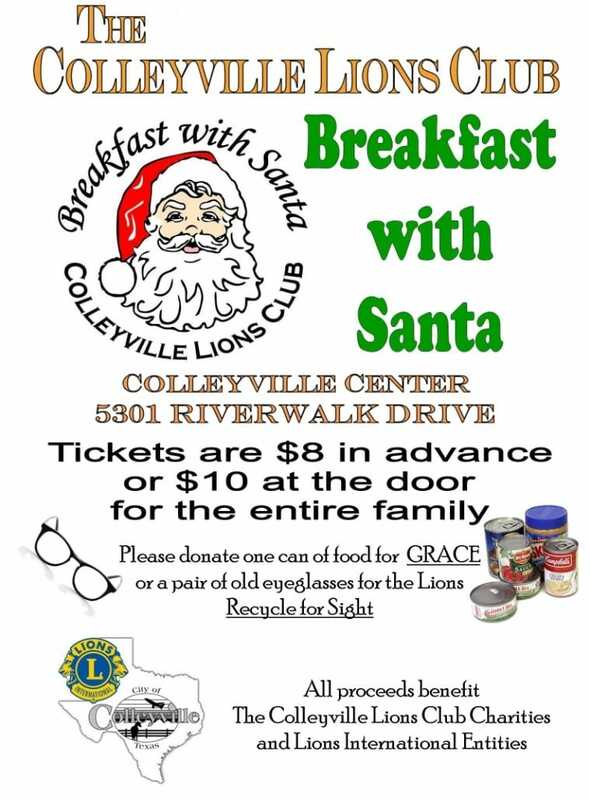 $8 for your entire family with coupon and a donation of either one can of food or a pair of old eyeglasses per each family member.Please join us and have your picture taken with Santa, enjoy live holiday music all morning and the best pancakes in Colleyville! I just want to say to all the BWS Committee that this was a record year and to thank you all that work so hard together as a team to make it all happen. We had a great two days. I don’t think I could stand it more than once a year. Our attendance was in excess of 1400 and based on the number of plates remaining we served over 1375 Breakfasts. The door count with tickets was 1099. That does not include the two choirs of close to 100 members each, 15 Jumping Jammers, 95 or more Lions – family and friends, Teen Court Kids, 10-7th grade girls from the Keller First Baptist Church, and other volunteers including SNAP. Based on Picture Money, BWS Ticket Money, and Sponsor Money (Some to be collected); BWS will net at least $20,500. There will be some more ticket money to come in. We tackle the Presbyterian Night Shelter Christmas Eve Breakfast next. Have a great week and see you Friday. Not only was it better but bigger. Our new Gas Griddles have retired the old cooker.